In the afternoon, the President will return to Washington, D.C. from his whirlwind trip to Afghanistan. President Obama will participate in an Ambassador Credentialing Ceremony late in the afternoon in the Oval Office . The traditional ceremony marks the beginning of an Ambassador's service in Washington. In the evening, the President will attend two campaign events in Washington, DC. These events at The W Hotel are closed press. « Previous entryTrip to Afghanistan "a scene from a spy novel"
Great job visiting Afghanistan on this particular day Mr. President. Very presidential of you. "We broke the Taliban 's momentum." –Last week, near-simultaneous assaults on embassies, government buildings and NATO bases in Kabul. "We can see the light of a new day,"
–And as our coalition agreed, by the end of 2014 the Afghans will be fully responsible for the security of their country." Bill Clinton is our First Black President! Slick Willy appreciated Robert Byrd. Yea Mr. President, woooo hooooo, all that way to spike the footballl......... again!!!! Visiting the troops is not, but prematurely standing under a sign that states "Mission Accomplished" 8 years before the fact is definitely spiking the ball. I don't recall Bush actually hanging the sign! Do you? Very doubtful but..keep hope alive! SO MANY BUSH APOLOGISTS. IT MAKES SENSE TO REFERENCE BUSH WHEN HE SPIKED THE FOOTBALL BEFORE THE GAME EVEN STARTED. LOL Jean – and we've all seen what a CF that turned out to be. At least Obama visited there 3 times during the last 3 yrs. Bush was too busy hiding out at his Crawford ranch to go anywhere the last 2 yrs of his Presidency. he just caused an attack that killed several people as he flew out of the country....he was grandstanding for reelection...he is a despicable human being, a cold eyed opportunist with no morality. This is part of his reelection manipulation...and believe me people see through this...he is a phony to the bone. No, but if you read this report the White House took care of production of the sign. "Bush's attempt to explain the banner at a press conference Tuesday only heightened the controversy, with the White House attempting to dig itself out. What (the president) said was that it was put up by the Navy, by people on board the ship and that was correct," his spokesman Scott McClellan said Wednesday. "It was an idea that was suggested by those on the ship as a way to honor the sailors and crew on board the USS Lincoln for accomplishing their mission." He acknowledged however: "The Navy asked us to take care of the production of the banner." The administration "said that the Navy called for it, and that was a fabrication because they then later acknowledged that it was the White House who created the banner," said Daschle." @defguy Maybe if Bush hadn't been such an all around presidential disaster we wouldn't need to repeat the discussion. @Jean...LOL! Ha ha ha! LOL! That is soooo funny! THANKS jean! LOL!! What do you mean by the words "spiking the ball"? Basically it is holding an impromptu celebration after a touchdown before the game is over. What do American Women Want? Free Abortions or Free Contriceptives? Just wondering if wHousHinne has ever visited the other Virginia? He will need to fly in there at night, just like he did in Afganistan. AND NOW FOR THE BIG FIGHT!!!! The CLASH of the TITANS! In this corner, wearing GREEN,,, are the Environmentalists! And in this corner, wearing PURPLE,,, are the Unionists! The BIG SMACK DOWN of 2012 !!!! It is not a fight of Red vs Blue! It is a fight for JOBS! Now tell me, how is you Hope and Changie Thing working for all of you Working Families? When he is done with that, how about keeping him busy – give him a beer or two, or three, 4,5 ,6....just keep him busy please. YOU CAN TRY OFFERING ROMNEY A BEER, BUT I'M NOT SURE IF HE EVEN KNOW WHAT THAT IS. I'M SURE HIS DADDY DID. He will be busy taking care of government business and campaigning and he will do a good job of both. Let the good folks in the video tell us how good this Prezzie Is! but the message gets out! They will ley you know! Are there Trees in Afganistan? Do they have Tree Huggers in Afganistan? Will they have Trees in Heaven (after they are Martyred) to hug? glad you are home safe. You bring honor to this country. Glad you where there for the troops. Obama 2012 the only choice forward. Thanks for the chuckle, I needed that !!!! Anonymous,Chavez is currently busy tyinrg to undermine the government of Columbia so it seems inaccurate to say that Chavez will have nothing to do with Columbia. If Chavez is successful, he will have expanded his influence even further. Right now Venezuela is the greatest threat to the United States in this hemisphere. If we are going to contain it, we MUST have help. As for human rights records, media darlings such as the "Palestinians", the Russians, and Cuba have far worse human rights records or at least very bad human rights records. Yet we don't hear much about them from the media except fawning praise. The media trots out "human rights abuses" when they want to slime someone they don't like. A human rights record has to be examined within the proper context. Also, we have worked with countries with less than perfect records in the past, as our record on this issue is less than perfect. Circumstances may dictate that we need to do the same again. Getting together others who can help us contain the growing threat from Venezuela is mission critical to the survival of America. Btw, from the best I've been able to determine, I agree with Freedom Fighter that the free trade agreement with Columbia will not take jobs away from Americans. It should increase American jobs, as we will be exporting more to Columbia. Most important of all this agreement will be very helpful a beleagured ally in the region. We MUST have allies in the region, if we wish to contain the hostile power of Venezuela. Ultimately our very survival may well depend upon being able to forge working relationships with countries like Columbia. LOL, go take your meds Judy you need them. Just another several million of taxpayers hard earn money being wasted. How many more trips are u going to waste taxpayers hard earned dollars on before youre voted out of the WHITE house, mr. nobama? IF YOU HAVE TO ASK THESE STUPID QUESTIONS THEN I WONDER IF YOU EVEN LIVE IN THIS COUNTRY LONG ENOUGH TO BE PAYING TAXES. ONCE AGAIN, IT'S NOT OK IF OBAMA DOES IT. SMELL THE HYPOCRISY. ANYWAY, SOMEWHERE IN THE ROMNEY CAMP, SOMEONE IS SHAKING WITH FEAR. IT'S NOT THE DOG THIS TIME. HAHAHAHAA!!!! oh I listened to obamas speech and it made me sick..the way he referenced his policies and their success...after, of course, mentioning seal team six.... he is a typical narcissistic... and remember he said his dad served in ww2(a lie) and his uncle was a death camp liberator (which of course could have happened, with the indicated camp, only be true if he were in the Russian Army. Only a very short list of lies and distortions from obama...he is despicable. He probably came back to give the OWS free loaders a call, as usual they destroyed property and accomplished nothing. @ judy me too.Would definitly not want have anything to happen to obama before we vote him out,it would mean biden would be president and thats SCAREY. @ 2012 your wrong about the dog the prez is hungry! yes...obama flew out and the Taliban attacked...killing several people in a "secure zone"... the truth is we are losing this war...and our troops are handcuffed by this administration with no fire zones and restrictions...they even give them medals for military restraint (hard to believe)....try fighting a ruthless no holds bared enemy when you are restrained like this. We hear very little of the daily activities as there is a news blackout in Afgan. The American people have already awakened to the truth that the stimulus bill - a great idea in theory - was really an immense bribe to Democrat interest groups, and in no way helped all Americans. "a bureaucracy lowering costs in a free society." Either the costs go up or the free society goes away... an historical truth. As I said before, Ben Stein is a moron. oh that means something coming from you...yes sir! hahaha, Stein a moron. He vacations at a remote lake we also use in the summers...a very humble yet bright guy...even you jean would like him...unless you are a racist or perhaps dislike Jews.. are you a Jew hater jean2009? @ exlax I don't get bogged down on things like a persons' religion or skin color. I look at what they promote, and put to print....Ben Stein is a bigoted moron who is only worried about tax breaks for the rich. .
"I don't get bogged down on things like a persons' religion or skin color." Jean, this is a joke – right? We see your posts every day Jean. How nice, Obama goes over their bragging, within hours after he leaves, Taliban explodes bombs. Yup Obama we really got them good, ya loser. Really Scott what can be said about any group that kills their own people? They were killing their own people years before we were there. Afghanistan is one of the poorest countries in the world and has a long history of internal conflict dating back to the early 1900's. "It was the second major assault in Kabul in less than three weeks and highlighted the Taliban’s continued ability to strike in the heavily guarded capital even when security had been tightened security for the high profile events." Did jerryexlax and you report the previous attack; the one two weeks ago before the president arrived? don't you just love it? These left winger nut cases just love to bring President Bush up..when obama is in trouble. Now it is JEAN2009 again...come on here, President Bush, a former pilot, son of a former WW2 pilot landed on this Carrier that had just completed the longest carrier deployment since the Vietnam war...the carrier was celebrating their mission accomplished... this was not Bushs reelection campaign and claim of completing the war in Iraq...even obama would know better than make that claim at that time. These past two weeks have been bad for obama...down in the polls because the economy is a mess, the middle east is falling apart (Israel is calling up military reserves), oil prices record highs, the afgan war is losing, and obama is getting kicked around by the supreme court on his crazy imigration laws and health care...in short his popularity is falling like a rock and Romney has yet to really go after him. obama is his own worst enemy...and the American people are seeing who he really is...and it is clear he is not a real American with an American brain...now is the time when real leadership, moral integrity, experience, and intelligence is required...and, Barry Sorento/barack hussain obama just does not have it. He has to date done more reelection fund raisers than all of our (real)Presidents have done since 1977COMBINED...he has no record so he has to buy media and do his usual sales job with the monitors and etc...the empty shirt president. No exlax he was spiking the ball. Great. it appears his spiking of the ball includes another 4 billion a year for at least 12 more years in Afghanistan. We are discussing the premature Mission Accomplished sign George W. Bush posted on the U. S. Abraham Lincoln. Jean, everyone knows that sign was related to a specific mission. We also know it is now history, same as Bush. So Jean, you agree with 4 billion a year for 12 years to Afghanistan? I assume you do because it is an Obama accomplishmnet. @exlax...here is: "The Handy Reference Guide to Bush Disasters,Incompetency, and Lies." Please Please tell me Atty Berg . If it is proven that Barry Soetoro is deiltfneiy NOT a natural born US citizen, Isn't that an impeachable offense and Hopefully punishable by imprisonment and or deportation? I can only DREAM that We the People can find him as the LIAR that he is! and prosecute him as any illegal immigrant would be, to the fullest extent!!! Prison would be to easy for this Lying SCUMBAG! Maybe we could even lock him up at Guantanamo Bay as the terrorist sympathizer he truly IS! The economy is a mess due to George W. Bush. Who owns the largest portion of debt this country owes. GEORGE W BUSH – keep in mind that the major part of Obama's deficit problems (interest, stupid tax cuts and wars in two countries) were inherited from Bush and couldn't exactly be cut off. Jean, you are looking very desperate with the repeated Bush references. Take a break, have a little snack, I hear Bulldog is good, then try to put your spinf on the 4 billion a year Obama just sent to Afghanistan. @Steveo,...I don't see that it mattered who actually hung the sign. The thing is GWB felt feisty and proud enough to stand up there in front of it on camera and taking pictures!! Had President Obama done anything close to that, we never would have heard the end of it!!! The media wouldn't have let it go, nor his haters, who just sooooo enjoy pointing fingers at him on the most stupid, but human things!! Notwithstanding, the political banter you all have been waging against him, and the over-the-top tirades and vitriol you spew at him like 'saliva'; I feel very sure the media and his antagonistic, haters, dismissive obstructionists, bigots, and racists will be blasting every little thing they can drum up to continue to berate, beat-down and bash him with, long after he has left the Oval Office! So let us have our time. However, I believe that if history is properly documented about this President and everything he's done to start-up America's engine again, the truth will always override lies, hate and malicious rhetoric!! @acdcguy,....how original can we get?? George W Bush is 'original!! He outdone his own daddy!! The Bush Blunders are 'Originals'!! He and they are 'One-of-a-Kind'!! If you think you can just continue to bash and berate a sitting President of The United States, who's genuinely working hard to pick us ALL up off the ground, where BUSH/CHENEY left us; and expect us not to continue to remind you of how we got here in the first place, you have another thought coming!! Now that would be 'ORIGINAL'!!! LOL!! Are you calling stating facts "bashing"? America 1st, Scott, acdcguy, and all of you others who are sitting back hoping America fails, just to make sure Obama fails; it will not work!! You are the ones who are un-American!! At the risk of all Americans living portions, menial and humble lifestyles, you folk are willing to undermine and obstruct everything this man does inside and outside the US!! As far as his foreign policy agenda,...Obama is THE MAN!! You folk are just jealous and hateful!! We can't help that your Bush wasn't and it's been proven all the way through this administration!! I wouldn't be surprised that when the truth comes out, that bombing in Afghanistan did not come from the Taliban!! It was a 'set up' once again to make President Obama look bad!! That's what sabotage and undermining is!! I wouldn't be shocked to find out it was a fringe of the military that set off that bombing. I don't put it pass even Lucifer Cheney, to call over there , right before the President ieaves to have them to do that to put a drag on the noble diplomatic mission, try to dismiss and dicredit it to a 'less than perfect visit!! There are military right on this blog site who hate the President!! So that assumption is not that far-fetched, nor inconcievable!! They have done much to trip him up right here at home, so that long arm of evil is capable of stretching overseas too! Sad but so true!! It's hateful and pathetic really!! Hate is such a strong word. I do not hate anyone and I do not hate Obama, he seems to be a nice guy. What I do hate is his policies and the direction he is taking our great country. He is the one "failing". The list of his failures is too long and I'm tired of repeating all of them . But the one I will list is debt. We cannot continue down this path of uncontrolled spending. It is not fair to us and the next generations to come. @defguy After 8 years of wrong headed polices that put the economy in a ditch the country is again headed in the right direction...now that the right man is at the helm and in the White House. Actually, if what we are hearing is true i.e. 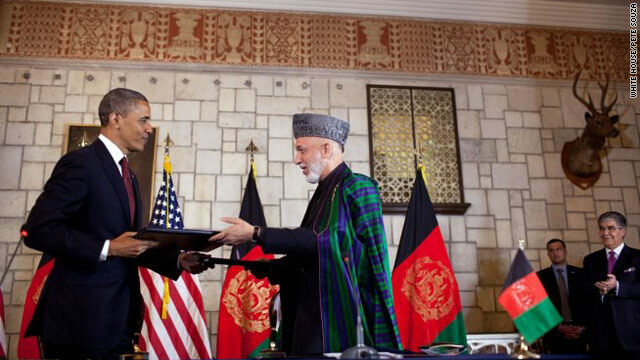 another 4 billion a year for at least 12 more years in Afghanistan it appears the agreement BO made actually put Afghanistan first. Obama threatens the elderly and the sick during budget talks, but then he commits 12 years of massave resources to Afghanistan? The priorities are as messed up as it gets. John, as hard as we try, you just can't fix stupid. Best we can do is just wish them luck and move on!!! Liz, it seems to me people like you are setting up America to fail. The past 3.5 years have been a failure and you, and people like you, want 4 more years of it. Talk about hating America. If you don't hate America why do you support changing it to something else? @John...other than what could be read as just a little sarcasm in your response on this subject, I think I'd have to agree with you on this one. Yes that was a great 'Presidential' move on Obama's part to go to Afghanistan on the anniversary of OBLs death! I also believe that it was a great diplomatic move by a great 'Statesman' too!! No sarcasism at all. As I have said in the past, I call them the way I see them. The initial reports did not mention any of the details of the deal Obama agreed to. As usual, the media shills wanted to elevate Obama and did not provide us with the entire story. The details of the agreement are still vague, but we are beginning to hear the costs of the agreement is 4 billion a year and another 12 years of our military in Afghanistan. If this is the case Obama turned what I thought was a good thing i.e. visiting the troops on a special day – to a terrible thing. And I forgot Obamacare, the drinlilg ban, all the czars, his radical pro-choice record, etc. It's hard to keep track of all the reasons not to vote for Mr. Obama.
. There are other graphs abailivle that help tell the entire picture. The raw data is abailivle. People have identified the limitations and problems with the data set. The furor over this graphic is that it says something that a large number of people don't want to believe, either because of their core beliefs or because it clashes with (mis) information from other sources that they trust.So they attack the data, the message, the graphic and seak to discredit it. Me? I think this is simply a datapoint with a positive trend and there are issues with data quality, but overall this is accurate. It makes its point simply and is understandable.And that's what is making people uncomfortable. This could have been about any polorizing topic and we would be having the same discussion.The more interesting concept here is the relation of the information to the viewer and the cognitive dissondance that it is causing.